I’m seeing a lot of search results coming in for this topic and while I have answered this in the past, it was for a different version update and will lose relevance. Also note that Ubuntu 8.10 Intrepid Ibex is not scheduled to be released automatically until October 30, 2008. 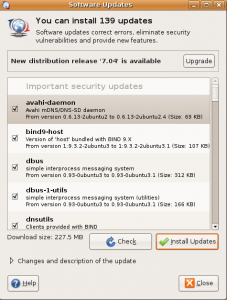 Upgrading at this point will update your system to Ubuntu 8.10 Alpha 6. If you wait until October 2nd you will upgrade to the Beta Release and waiting until October 23rd will upgrade you to the Release Candidate. I’ve been using Ubuntu 8.10 since Alpha 1 and it has been stable and amazing the entire time! 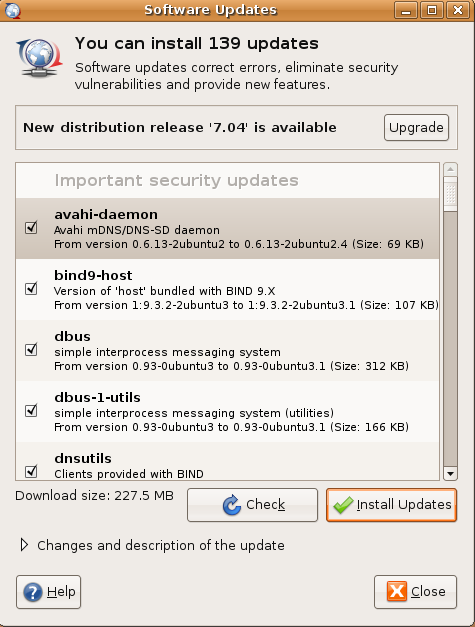 To upgrade from Ubuntu 8.04, run “update-manager -d” using the update-manager package from hardy. You can do this quickly by pressing Alt+F2 to launch the Run Application dialog and paste and press enter. This will launch the Update Manager, but it will also at the same time search for release updates. There should be an “Upgrade” button to the right of it. Clicking this button will guide you through upgrading to the latest release. Press Alt+F2 to launch the Run Application dialog. Copy and paste “update-manager -d” and press enter. Click the “Upgrade” button in the Update Manager window. Follow the steps and make sure to reboot when you’re told to.